23 Feb 2005 - Version 0.94.14rc21 released! The gzip tarball (199,950 bytes) is here and the detached signature for the tarball is here. The bzip2 tarball (165,622 bytes) is here and the detached signature for the tarball is here. Version 0.94.14rc21 can be considered a cleanup release, in preparation for the final (really!) 0.94.14 copy. If no problems are found, expect that final release in a week or two. The code now passes modern GCC on 32-bit and 64-bit architectures with no warnings, even with the the warning level turned insanely high (see GCC_FLAGS in src/Makefile.in). 10 June 2004 - Version 0.94.14rc20 released! The gzip tarball (200,395 bytes) is here and the detached signature for the tarball is here. The bzip2 tarball (166,433 bytes) is here and the detached signature for the tarball is here. Version 0.94.14rc20 fixes an additional multi-range response bug found on June 8th, and a host of other small improvements. A potential invalid memory access has also been fixed. Lastly, the rpm spec files and support files have been made at least partially SuSE-aware. Many of the changes pertain to increasing use of splint. without having read a single byte. 29 March 2004 - Version 0.94.14rc19 released! The gzip tarball (198,058 bytes) is here and the detached signature for the tarball is here. The bzip2 tarball (164,400 bytes) is here and the detached signature for the tarball is here. Version 0.94.14rc19 fixes some multi-range responses, and adds a few otherwise minor detail changes and feature improvements. Most of the items below are general code readability improvements or refactoring. The only bugfixes in this release pertain to multi-part range responses, and one very small bug (Boa was being a bit too pedantic) regarding blank header values in headers; Boa now accepts the empty header value silently. * change common_cgi_env to be dynamically sized, using realloc. the key and value of another common environment variable for CGI. This item requires the previous change. * in 503, remove \r from the human-readable message. 08 December 2003 - Version 0.94.14rc18 released! The gzip tarball (195,950 bytes) is here and the detached signature for the tarball is here. The bzip2 tarball (162,657 bytes) is here and the detached signature for the tarball is here. This is 0.94.14rc18. This is a cleanup release, and is the result of continuing efforts to clean and improve the code. It is likely that the most important change is the last, pertaining to multipart range responses. I got the order of some responses wrong. * remove some superflous send_r_error statements. * in poll.c, don't just check for BOA_READ, but handle all "error"
conditions first, then check for /any/ revent. * add and use TIMED_OUT state for requests that time out. Corrected the location of uClinux. 11 March 2003 - Version 0.94.14rc17 released! The gzip tarball (172,209 bytes) is here and the detached signature for the tarball is here. The bzip2 tarball (145,438 bytes) is here and the detached signature for the tarball is here. This is 0.94.14rc17. This is a cleanup release, and is the result of continuing efforts to clean and improve the code. * if key or value for an http header is invalid, log it. 22 February 2003 - Version 0.94.14rc16 released! The gzip tarball (171,296 bytes) is here and the detached signature for the tarball is here. The bzip2 tarball (144,827 bytes) is here and the detached signature for the tarball is here. This is 0.94.14rc16. This is a cleanup release. An extensive effort was made to generally improve the code. and values are to the error log. * warn when find_alias is sent a uri_len of 0. 18 February 2003 - Version 0.94.14rc15 released! The gzip tarball (170,118 bytes) is here and the detached signature for the tarball is here. The bzip2 tarball (143,735 bytes) is here and the detached signature for the tarball is here. This is 0.94.14rc15. This is a very important release. An segmentation fault problem was discovered that could be triggered from the network, causing a Denial of Service. We do not think this is normally exploitable outside of a DoS. There are a few minor fixes and improvements as well, but all users of the 0.94.14rc series should upgrade to 0.94.14rc15 as soon as possible. just warn, also close it down and place on the free list. * clean up logline parsing. This fixes a potential sigseg! Thanks again to one of our users, we think we've tracked down the problem, and it effects all versions of Boa starting with 0.94.14rc4. (four, not fourteen). The problem is a potential *huge* memcpy and overwriting of memory. We don't know if the problem is exploitable for other than DoS. All 0.94.14 release candidates have been pulled. An unknown problem with 0.94.14* was just reported by one of our users. Until the nature of the problem can be determined, it is recommended that everyone continue using 0.94.13. 7 February 2003 - Version 0.94.14rc14 released! The gzip tarball (169,464 bytes) is here and the detached signature for the tarball is here. The bzip2 tarball (143,343 bytes) is here and the detached signature for the tarball is here. This is 0.94.14rc14. This is a minor cleanup of rc13. Also, if anybody can provide us with documentation on how sendfile on Solaris works, that would be cool. Another note: I (JDN) spent quite a bit of time cleaning up the documentation, which I had turned into DocBook XML. You can find the alternate form of the documentation in html form here. Note that the documentation is now covered under the GFDL. No determination has been made as to whether the texinfo docs will continue to be maintained, the DocBook XML will replace it, or some other course of action will occur. We'd be interested in your comments. 23 January 2003 - Version 0.94.14rc13 released! The gzip tarball (169,280 bytes) is here and the detached signature for the tarball is here. The bzip2 tarball (142,929 bytes) is here and the detached signature for the tarball is here. This is 0.94.14rc13. This release improves select and poll somewhat, and helps to avoid out-of-file errors as well. It also fixes the __func__ support introduced with rc12. arbitarily setting it to 2048.
connections -- currently simply set at 20. 22 January 2003 - Version 0.94.14rc12 released! The gzip tarball (168,737 bytes) is here and the detached signature for the tarball is here. The bzip2 tarball (142,721 bytes) is here and the detached signature for the tarball is here. This is 0.94.14rc12. This is pretty much a minor clean up release -- a new directive, 'DefaultCharset' has been added, boa.texi has been updated to include some missing directives, and some otherwise fairly minor changes have been made. otherwise it is safe to assume we simply ran out of hash table space. * Some optimizations in HTTP header parsing. character set given, will be appended to all text mime types. 14 January 2003 - Version 0.94.14rc11 released! The gzip tarball (166,649 bytes) is here and the detached signature for the tarball is here. The bzip2 tarball (141,368 bytes) is here and the detached signature for the tarball is here. This is 0.94.14rc11 - 'HEAD' method is back, and the annoying "connection timed out bug" is also fixed. Also, a *huge* (54KB) patch went in to change many signed ints to unsigned ints, add the "const" and "static" keywords where appropriate, and make otherwise very few changes. instead of signed ints, and "const" where appropriate. 10 January 2003 - Version 0.94.14rc10 released! The gzip tarball (166,403 bytes) is here and the detached signature for the tarball is here. The bzip2 tarball (140,923 bytes) is here and the detached signature for the tarball is here. This is 0.94.14rc10 - A few bugs found and squished, and some other improvements. far too huge for a single IPv4 IP address in dotted-quad notation. * allow a MAX_FILE_MMAP value of 0 to mean "always mmap"
1 January 2003 - Version 0.94.14rc9 released! The gzip tarball (166,655 bytes) is here and the detached signature for the tarball is here. The bzip2 tarball (140,212 bytes) is here and the detached signature for the tarball is here. This is 0.94.14rc9 - a few changes to the configure system, completely rewritten loops for select and poll, and much better support for ranges in requests. A few bugs fixed. report the number of bytes actually written to the socket. say silently shut it down and don't be noisy about logging it. 13 December 2002 - Version 0.94.14rc8 released! The gzip tarball (163,202 bytes) is here and the detached signature for the tarball is here. The bzip2 tarball (137,559 bytes) is here and the detached signature for the tarball is here. This is 0.94.14rc8 - one more range related fix, Linux only when using sendfile, and file was > 100K, and range *started* after 0 bytes. Also a few *BSD fixes, basic access by sunsite.dk (note, it's disabled by default, would someone else please look through it? ), and finally a few fixes: one for a backwards ordering in the add_mime_type function, and a fix for the check-for-broken-setuid check in boa.c -- root *is* a legal user. This release also includes some sprintf removals -- I think it won't be long before boa starts using a string library of some kind, probably something in-house, possibly patterned after a djb-like string handling mechanism, or perhaps the string mechanism used by GNUTLS. 24 November 2002 - Version 0.94.14rc7 released! The gzip tarball (160,521 bytes) is here and the detached signature for the tarball is here. The bzip2 tarball (135,601 bytes) is here and the detached signature for the tarball is here. This is 0.94.14rc7 - several 'range'-related bug fixes, including an inadvertant memory overwrite resulting in eventual corruption -- introduced in rc4 or rc5. Please give this a thorough testing, as this includes "range" (resume) support. 23 November 2002 - Version 0.94.14rc6 released! The gzip tarball (160,493 bytes) is here and the detached signature for the tarball is here. The bzip2 tarball (135,736 bytes) is here and the detached signature for the tarball is here. This is 0.94.14rc6 - changes include fixes to Range support, support for Range with large files on non-Linux platforms, and some Range-related bugfixes. Please give this a thorough testing, as this includes "range" (resume) support. Try not to use 0.94.14rc5 for now, jnelson found some annoying bugs in it. Fixes are forthcoming. 20 November 2002 - Version 0.94.14rc5 released! The gzip tarball (160,276 bytes) is here and the detached signature for the tarball is here. The bzip2 tarball (135,480 bytes) is here and the detached signature for the tarball is here. Please give this a thorough testing, as this includes "range" (resume) support. (At least, for all platforms, and for files > 100K, on Linux). 29 October 2002 - Version 0.94.14rc4 released! The gzip tarball (157,830 bytes) is here and the detached signature for the tarball is here. The bzip2 tarball (133,834 bytes) is here and the detached signature for the tarball is here. Note - no range support is included quite yet, but it's very close. It's very likely that the next version will support range and multipart/range. 26 October 2002 - Version 0.94.14rc3 released! The gzip tarball (154,366 bytes) is here and the detached signature for the tarball is here. The bzip2 tarball (131,369 bytes) is here and the detached signature for the tarball is here. This is 0.94.14rc3 - changes include a fix to aliasing introduced in 0.94.14rc2, and some small backports from 0.95 to aid debugging. The backported code makes no run-time changes unless you edit the source file. 26 October 2002 - Version 0.94.14rc2 released! The gzip tarball (154,054 bytes) is here and the detached signature for the tarball is here. The bzip2 tarball (131,050 bytes) is here and the detached signature for the tarball is here. This is 0.94.14rc2 - the only change is a revised configuration parsing system which no longer relies on lex or yacc -- there are simply too many incompatible versions out there. I also ran the source through 'indent' again. 20 October 2002 - Version 0.94.14rc1 released! The gzip tarball (154,709 bytes) is here and the detached signature for the tarball is here. The bzip2 tarball (133,006 bytes) is here and the detached signature for the tarball is here. Boa 0.94.14 incorporates many features that have been waiting for quite some time, not the least of which is a stab at name-based virtualhosting, sendfile support (on Linux), much better cross-platform compilation, better heavy-load performance, poll(2) support, many tweaks and a good dose of fine-tuning. The default behavior for Boa has not changed substantially, so most people should have a completely seamless upgrade, but the new functionality is there for people to use. Note one bonus is now being able to use Boa with supervise from daemontools or freedt. it obtains with the first accept()ed socket. sendfile support for files > 100K is default, now. October 4-5 2002 - Developer's Conference 2002! Larry and one of his sons stayed at Jon's house October 4-5, 2002. 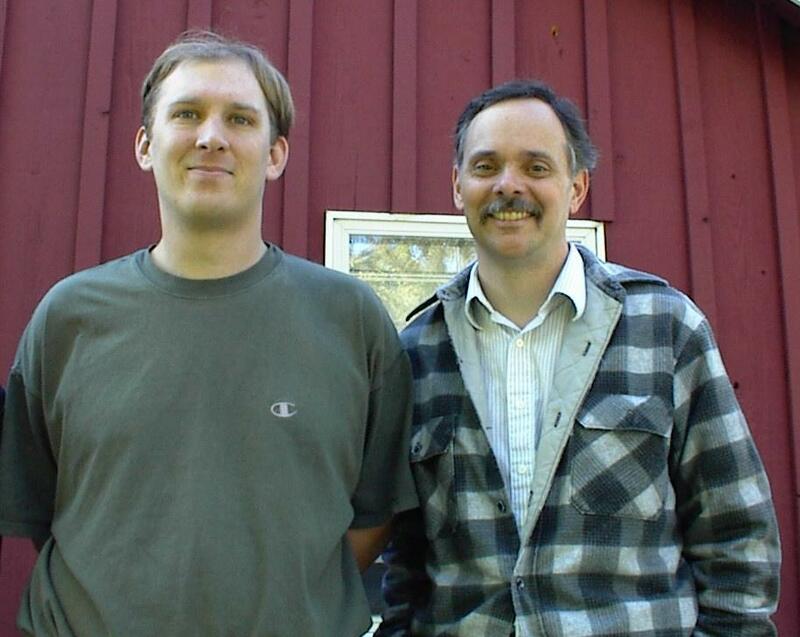 While the reasons were unrelated to Boa development, and in fact Larry and Jon spent only a few hours discussing Boa, computers, and the Free World, it seemed appropriate to refer to the event as a Developer's Conference. Here is a picture of Larry and Jon at Jon's house. (Left to right: Jon, Larry). Please forgive my really bad digital camera. 30 July 2002 - Version 0.94.13 released! The tarball (122,066 bytes) is here and the detached signature for the tarball is here. Boa 0.94.13 is primarily a "clean up" release, which means that most of the changes made are to improve the overall quality of the code, without introducing many new features. There are some bug fixes, and some new features, but the overall changes have been to do a better job of checking the results of system calls and memory allocations. 4 May 2002 - Version 0.94.12 released! The tarball (118,118 bytes) is here and the detached signature for the tarball is here. 5 Apr 2002 - Version 0.94.12rc8 released. The tarball (118,136 bytes) is here and the detached signature for the tarball is here. There is only 1 difference between 0.94.12rc7 and 0.94.12rc8 - a debugging statement has been removed. 3 Apr 2002 - Version 0.94.12rc7 released. The tarball (118,144 bytes) is here and the detached signature for the tarball is here. 24 Mar 2002 - Version 0.94.12rc6 released. The tarball (117,848 bytes) is here and the detached signature for the tarball is here. 22 Mar 2002 - Version 0.94.12rc5 released. The tarball (117,007 bytes) is here and the detached signature for the tarball is here. issues like "124.3" -> "123" and "123abc" -=> "123". Either a value is an int or it isn't - no middle ground. * use boa_atoi to convert content-length from client. (in bytes) the *default* single_post_limit. * single_post_limit is now in bytes. 16 Mar 2002 - Version 0.94.12rc4 released. The tarball (116,297 bytes) is here and the detached signature for the tarball is here. There are only two differences between 0.94.12rc3 and 0.94.12rc4 - a bug is fixed in POST, and a config file variable is introduced. Both are detailed below. 02 Mar 2002 - Version 0.94.12rc3 released. The tarball (116,134 bytes) is here and the detached signature for the tarball is here. Most of the updates to 0.94.12rc2 are fairly minor, and primarily help compilation on Solaris. Also, some signal handlers were improved, and the select loop is now in select.c, helping abstraction. Additionally, unless ORIGINAL_BEHAVIOR is #defined, Boa will now poll the server socket once per active connection until there are no more waiting requests. This should have two effects - a **very** slightly greater latency (if it is measured at all), but a **much** more consistent latency. Finally, Boa now tells clients that it is too busy, although in practical terms, this is not very likely to happen, due to various factors. 17 Feb 2002 - Version 0.94.12rc2 released. involving negative return values from hash routines. The tarball (115,050 bytes) is here and the detached signature for the tarball is here. 16 Feb 2002 - Version 0.94.11.1 released. This is a maintainence release of 0.94.11 until 0.94.12 is finished. It only changes 2 things: Makefile.in had a buglet where index_dir.o would not get removed on 'make clean', and the hashing algorithm used could return negative numbers resulting in a segfault. Both of these are fixed here, and *no* other changes have been made. The tarball (118,600 bytes) is here and the detached signature for the tarball is here. 11 Feb 2002 - Version 0.94.12rc1 released. This is technically 0.94.12pre4 but I don't think anything major will change between now and release. This version also removes email addresses from the ChangeLog and moves them to a CREDITS file. The CREDITS file will not be available in plaintext on the website, and can only be found in the tarball (or package). This is done to avoid SPAM. The detached signature for the tarball is here. The tarball (114,275 bytes) is here. 30 Jan 2002 - Version 0.94.12pre4 is being prepared. 20 Jan 2002 - Version 0.94.12pre3 has been released! Versions 0.94.12pre2 and 0.94.12pre1 had some minor bugs (and one show-stopper, regarding CGI) that 0.94.11 did not have. The changes between 0.94.12pre2 and 0.94.12pre3 include an updated .depend file, elimination of the lame MAINTAINER stuff in the Makefile, using fcntl + GET_FL to get a file descriptor's flags *before* setting or unsetting the fd's bits, making sure we call FD_ZERO on restart, and a few other minor improvements. The reason for the pre-releases is that there are quite a few changes in this release, and while most are geared towards better platform compatability (specifically, *BSD and Solaris), there are a few minor bugfixes as well. 11 Jan 2002 - Version 0.94.12pre2 released! 15 Dec 2001 - Version 0.94.12pre1 released! 05 Nov 2001 - Version 0.94.11 released!